Q-Connect Aluminium Frame Felt Noticeboard 1200x900mm Blue 9700029 Pack of 1 Aluminium Framed notice board. Top quality felt. Supplied complete with fittings. 1200x900mm. Blue Felt. 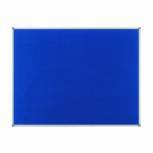 Q-Connect Aluminium Frame Felt Noticeboard 900x600mm Blue 9700028 Pack of 1 Q-Connect Aluminium Framed notice board. Top quality felt. Supplied complete with fittings. 900x600nmm. Blue Felt. 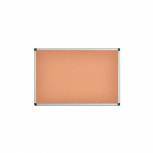 Q-Connect Lightweight Cork Noticeboard 900x1200mm KF03568 Pack of 1 Q-Connect Cork Board. Lightweight notice board with wooden trim, supplied complete with fixing kit. Size - 900 x 1200mm. 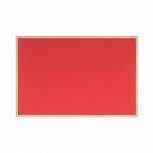 Bi-Office Cork and Drywipe Combination Board 900x600mm MX07001010 Pack of 1 Bi-Office Cork/Write-On Wipe-Off Board. Lightweight, dual purpose board supplied with drywipe pens and pins. Size: 600x900mm. Q-Connect Aluminium Frame Felt Noticeboard 1800x1200mm Grey 9700027 Pack of 1 Q-Connect Aluminium Framed notice board. Top quality felt. Supplied complete with fittings. 1800 x 1200mm. Grey Felt. 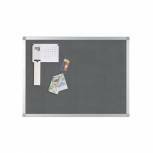 Q-Connect Aluminium Frame Felt Noticeboard 1200x900mm Grey 9700026 Pack of 1 Q-Connect Aluminium Framed notice board. Top quality felt. Supplied complete with fittings. 1200x900mm. Grey Felt. 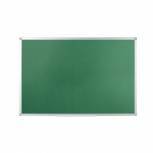 Q-Connect Aluminium Frame Felt Noticeboard 1200x900mm Green 54034204 Pack of 1 Q-Connect Aluminium Framed notice board. Top quality Green felt. Supplied complete with fittings. 1200x900nmm. Q-Connect Aluminium Frame Felt Noticeboard 900x600mm Grey 9700025 Pack of 1 Q-Connect Aluminium Framed notice board. Top quality felt. Supplied complete with fittings. 900x600nmm. Grey Felt. Q-Connect Aluminium Frame Felt Noticeboard 1800x1200mm Green 54034205 Pack of 1 Q-Connect Aluminium Framed notice board. Top quality Green felt. Supplied complete with fittings. 1800x1200nmm. 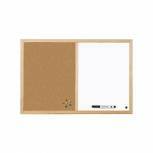 Bi-Office Double-Sided Board Cork and Felt 600x900mm FB0710010 Pack of 1 Bi-Office Memo Cork Board. Lightweight double-sided pin board. Felt on one side cork on the other. Supplied with necessary fixings. 900x600mm. Colour - Red. Nobo Classic Felt Noticeboard 900x600mm Blue 1900915 Pack of 1 Nobo Elipse Notice Board. Felt covered notice board. Other features include an aluminium frame with coloured corner caps that conceal wall fixings and fire resistant felt. Dimensions - 900 x 600mm. Colour - Blue. 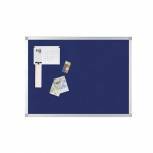 Nobo Classic Felt Noticeboard 1200x900mm Blue 1900916 Pack of 1 Nobo Elipse Notice Board. Felt covered notice board. Other features include an aluminium frame with coloured corner caps that conceal wall fixings and fire resistant felt. Dimensions - 1200 x 900mm. Colour - Blue. Nobo Drywipe and Felt Combination Board 900x600mm Blue 1902257 Pack of 1 Nobo Elipse Combo Board. Combination board featuring a magnetic drywipe surface and Blue felt notice board. Framed in aluminium with decorative corner caps concealing wall fixings. Dimensions - 900 x 600mm. wall fixings supplied. Nobo Classic Light Oak Noticeboard 900x600mm 37639003 Pack of 1 Modern styling with attractive light oak frame. Co-ordinates with the Nobo light oak range of drywipe and notice boards. Supplied with fixing kits. 900x600mm (3FTx2FT). 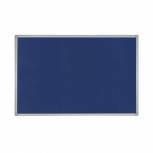 Bi-Office Felt Noticeboard 600x450mm Blue FB0443186 Pack of 1 Bi-Office Felt Notice Board. Smart bulletin board with aluminium finish trim and fire retardant felt. Supplied complete with colour corner caps and wall fixing kit. Size - 600 x 450mm. Colour - Blue. 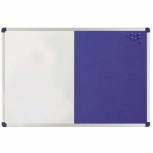 Bi-Office Felt Noticeboard 900x600mm Blue FB0743186 Pack of 1 Bi-Office Felt Notice Board. Smart bulletin board with aluminium finish trim and fire retardant felt. Supplied complete with colour corner caps and wall fixing kit. Size - 900 x 600mm. Colour - Blue. 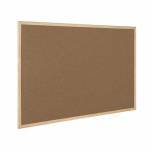 Bi-Office Aluminium Frame Cork Noticeboard 1200x900mm CA051170 Pack of 1 Bi-Office Cork Notice Board. Top quality notice board with self-healing cork and aluminium trim. Supplied complete with wall fixing kit. Size - 1200 x 900mm.